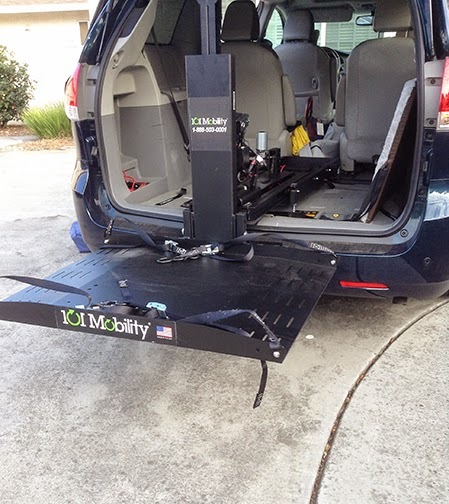 After having so much difficulty with my PriusV wagon (no one would put any kind of lift in it, I couldn't find someone to make an arm lift for it, the dog ramps were too difficult to maneuver with my back and too heavy for me, and I researched every possible solution and couldn't find anything that would work) I contacted Mobility 101 to find if I bought a Toyota Sienna could they put a lift in it for the TravelScoot. They found the lift solution before I purchased the Sienna. 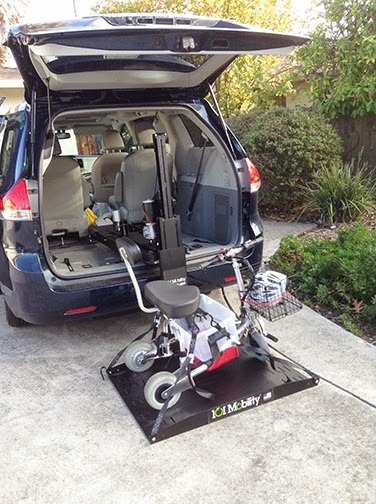 The Hammar Al-600 was the lift that had the seat attachment for the TravelScoot. 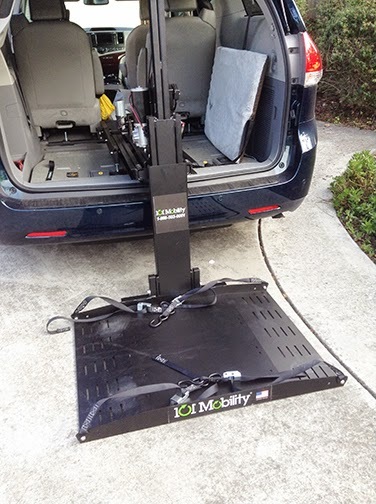 I decided on the platform lift because I wanted the greatest ease in getting the scooter in the car with the least amount of effort on my part. 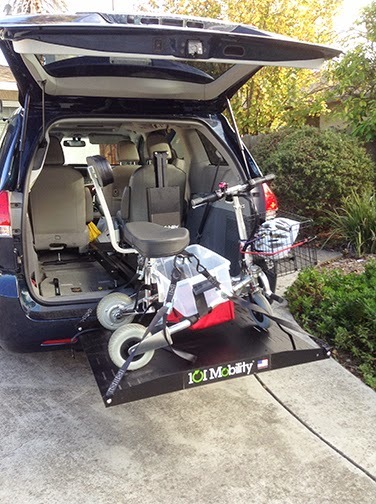 The pictures are of the various stages of the lift and scooter going out of the car. 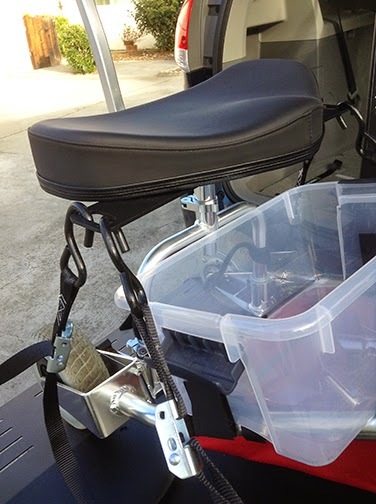 I also am showing you how the straps attach to the plate that is attached beneath the seat. I have a remote to use, as well as an attachment to the lift that also makes the lift work. Above the red canvas holder I have attached a plastic container that I use to hold items. I used about 2" wide pieces of velcro, which I attached on both sides. It shows up very clearly in the photos. I also looked into Braun Mobility Vehicles. 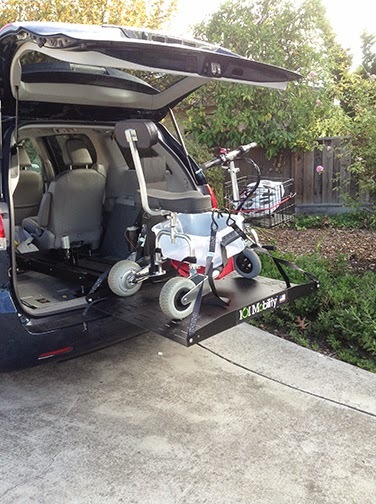 They take Toyota, Honda and Chrysler minivans, lower the floors and add ramps. The conversions cost about $26,000, so even used ones are very expensive. 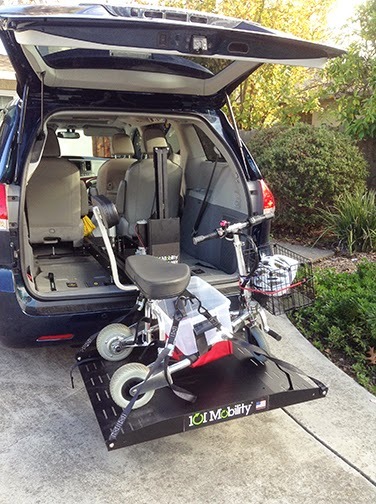 The advantage is that the ramp is already part of the vehicle and the floor is lowered for easy access. Also, if a person is in a wheelchair they can use their chair instead of the driver's seat. 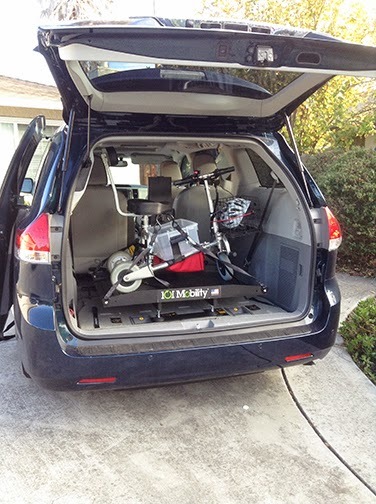 I thought that that route was way overkill for the TravelScoot and decided to get a minivan and put a lift in it. If I ever become more disabled and need a wheelchair, the lift I have could also accommodate one. My service dog is a 62 pound lab. With his harness on he was having trouble getting in and out of my previous sedan. 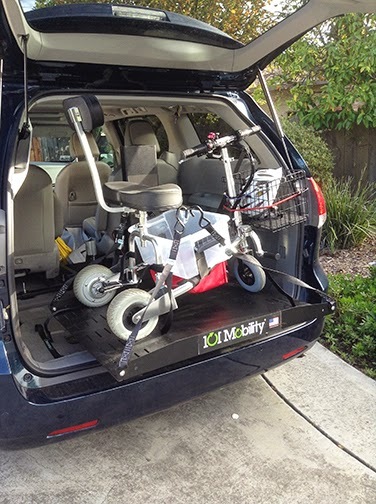 The Toyota Sienna has ample room for him to easily get in and out of the car. I bought some nice foam dog mats that I put on the floor to make it comfy for him. I have a service dog for mobility problems. Before getting my service dog I used a walker to get around. I am now recovering from my third back surgery, and the TravelScoot has been wonderful! My mobility has tremendously increased with the use of the scooter. I had researched light weight scooters, and even bought a different brand that was supposed to be a light weight scooter. That scooter was not very sturdy and I ended up returning it. Needless to say, the TravelScoot is everything that it was advertised as, very lightweight and very sturdy. 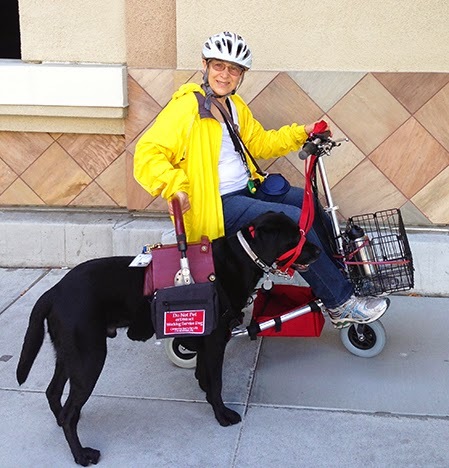 My dog, Inglis, from Canine Partners For Life, adjusts very well to walking along side the scooter. When we arrive at a destination on the scooter he is with me to provide balance and support, by my holding on to his harness, I have included a picture of Inglis and I on one of our many journeys on the scooter. Susan, a new TravelScoot user, wrote asking about your experiences with Norwegian. I've compiled the replies for this post. (Some are edited for length and relevance.) I am amazed at how many of you reached out to share your experiences. Thank you! To summarize the responses, many of you have taken cruises on Norwegian and used your TravelScoot without any problems. Some have done so multiple times. Others shared their cruise experience in general, and with the exception of a Viking River Cruise, had no problems. To see Susan's response, scroll to the bottom of this post. Marlee: I have used a Travelscoot with a lithium-ion battery since '09 and have been on Norwegian Dawn twice, 7 nights in '12 and 14 nights in'14, Epic for 14 nights in '14 and Getaway for 7. I used my TS on all of these and was never questioned in any way whatsoever. I never disclosed anything, nor made my battery an issue, much as I do on an airline. Have a marvelous time in Hawaii....a fantastic New Year!! Brian: I have a TravelScoot with the same batteries, (I have 2 on my scooter) and I had no problem the last 2 years both on the Breakaway sailing out of New York City. I also was aware of what is on their web site, and was told by TravelScoot that they were referring to batteries that can spill, yours can not spill. I hope you enjoy your cruise. Lynette & Michael: I travelled with Norwegian in 2013 with no trouble regarding the batteries. The question was never raised. I can thoroughly recommend Norwegian Line. The staff are very friendly and helpful. There was always someone there to help when going up and down the gangway. Nancy: I have traveled on Norwegian Cruise Lines with my TravelScoot. It was about 5 years ago. I do recommend you check with Norwegian. 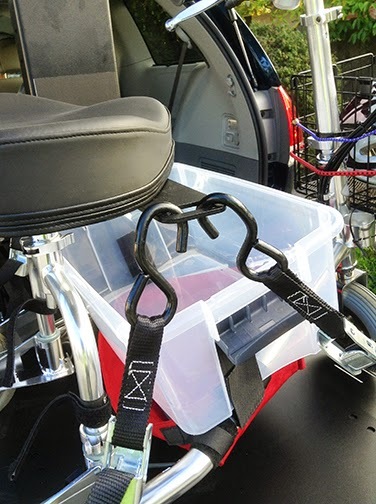 Although NCL does not have to comply with the ADA, I found them to be very helpful. Princess also had very nice crew wanting to assist in any way they could. Karen: I have gone on 2 Norwegian cruises and there was no problem bringing the TravelScoot on board. The lithium battery was no issue. Dato: Yes I had experience on same cruise line Dec 2013. There is no problem on lithium bat. The Cruise was from Rome. Eileen: I have had at least 5 cruises with my TravelScoot and not been questioned about it. I use it all around the ship, especially at the buffet and had a great time. They were very gracious and loved to drive it when I sat in the theater. Enjoy....this is a great cruise line. Anne: My only NCL cruise was on the original Norway, which was before my scooting days. Have taken my TravelScoot on Princess (which I cannot recommend for anyone with mobility challenges), Royal Caribbean, and Celebrity. None of them ever had a problem with the 'Scoot's non-spillable Li ion battery.I wonder if the term "gel-cell" on the NCL website really means non-spillable. I suggest you discuss this on the phone with on of their "Access Coordinators" at the number listed on their accessible traver page. Good luck! Carolyn: We traveled on four cruises since we got our scoots in May. Three on RCCL and once in Europe Avalon river cruise. Never had any trouble at all with our scoots on the cruise. We NEVER really told the cruise lines we had the TravelScoots, just show up each time, NO problem. There were many scooters, all different on board. On each of our RCCL cruises, we met someone with a TravelScoot, LOL, What a small world. Most of the people on their scooters asked about our TravelScoots as these were more smaller and light weight than their scooters. RCCL had a special checkin area for handicap. No need to wait in the regular checkin, just scoot past everyone. I am sure that Norwegian has the same policies. No one ever questions a handicap traveler. Have fun. Denise: I've cruised many times with my TravelScoot on cruises with no problem at all but not on NCL, only on Carnival RCCL and Princess. I would also ask this question on the Disabled Travel forum on Cruise-Critics if you haven't already done so. Have you called NCL's special needs department? One of the things I've always heard is the battery needs to be sealed and non-spillable with the Li-on is. Jack, in North Palm Beach, FL: You won't have any problem with any cruise line or airline. Years ago batteries were liquid acid which was pretty messy if leaked. Later they developed the gel battery which is used in most small scooters.They then further developed the battery to the lithium ion. I only have used my TravelScoot on Celebrity and numerous Holland America ships out of South Florida. Your ship's cabin door will be awfully tight if you bring in the scooter. Some cruise lines enforce the rule about keeping the aisles clear in case of an emergency (HAL did but Celebrity didn't). Enjoy your trip Susan. Glen: I no longer assume with cruise ships that I can take my TravelScoot. When I book my cruise I get a letter from the line that states that it is OK for me to bring my TravelScoot. They have a department that deals with such. I keep the letter with my travel docks. Go to your travel agent and have them help you to get the OK. I also let airlines know that I will be bringing my own scooter. Saves almost all last minute grief! Skaidra: I am a long time TravelScoot user and have sailed on many cruises with it. Whilst we have had to get pre approval from airlines (always successful) we have never had a problem with cruise lines and either has anyone we have spoken to on cruise ships and there have been many! This is the first problem I have heard of with any Cruise Line and Travelscoot. We have only ever used lithium batteries and they have always been accepted by the airlines AND cruise lines. We have cruised with Princess, Royal Caribbean and Seabourn. All we do is tell them we are bringing on a mobility scooter. I always ride it on and off the ship on embarkation, disembarking and at all ports of call. I am certain there will be other scooter riders on board your ship anyway. We were on the Rhapsody of the Seas over Christmas and there were many scooters on board including at least one other TravelScoot as well as other larger devices. My suggestion is ride it on board the ship when you embark. I doubt they will stop you boarding. Which ship is it? I will check it out. Have you booked through an agent? If so get them to get it sorted out. Please let me know how you get on. Jackie: Dear Susan you'll have a great time but for the ultimate answer you should call Norwegian unless you have a trusted experienced travel agent making your reservation you need to call yourself just call the 800 number when you get an answer that you like you should get their name and take that information with you to the ship remember while you talk to them they're taking notes in your record. After reheating their verbage I suspect they don't want lead acid batteries. Phil: Hi Susan, It does not make any sense to me, if air lines accept lithium-ion batteries ( assume that’s what you have) with the proper documents to go with it, you would take it that the shipping companies would have no problem .Why don’t you go back to the travel agent (unless you have done all your bookings via the web) to act on your behalf maybe they can twist their arm a bit and put some pressure on them to be reasonable about it. Also ring TravelScoot and get them to help in some way maybe they have dealt with this problem before. I have been thinking about doing a cruise later on this year so I would be interested to find out how you get on ……… Good luck! Mike: I would suggest that you contact TravelScoot. They have a lot of info. If airlines will allow a lithium ion battery, it would not make sense that a cruise line would not. Also, contact Norwegian. Someone there should have a definitive answer. Jacquie: While we have not tried Norweigan, we have had numerous visits on both Princess and Holland America, with no problems at all. The one thing they do require is that the Travelscoot must be able to fit through the stateroom door. Both the batteries are the lithium, nonspill varieties and have never been issues with the airlines or airports. Please have a wonderful time! Arthur: I can’t help you with your battery question but I can raise another issue. 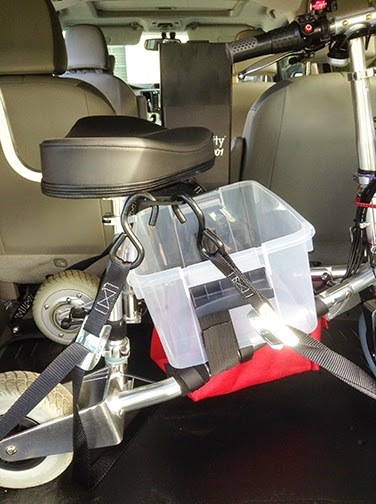 On a recent Cunard cruise I used a cruise supplied wheel chair rather than my scooter. They insisted that the chair be kept in my stateroom and not in the passageway outside, when not in use. Fortunately my room had a balcony where I kept the chair. Good luck. I am extremely grateful to all of those who took the time to answer my question. I now feel confident that I can bring my Travelscoot on the cruise. I have subsequently learned that Norwegian has a specific phone number to call regarding assistance needs and I can get additional help from them. Can you please thank for me the wonderful people who responded to my question? I am very appreciative!